I have a love-hate relationship with the M4. On one hand, I love the time-proven ergonomics, pleasant handling and low weight of the platform, but on the other (apparently more judgmental) hand, I hate that they’re so common. Even though there’s an abundant aftermarket for the M4 with nearly unlimited options for customization, it still seems that about 75 percent of the AEGs you see at the field are an M4 with a crane stock, quad rail, and various other bits and bobbles bolted to it. I respect the M4, but I’m rarely excited by it, which is why I’m glad to see the CPX .08 Concept Rifle Sportline by ICS. It’s an M4 with a twist. Not only does it look a bit different than your average carbine, it has a trick up its sleeve: ICS’s split gearbox design. Still, these changes mean nothing if it doesn’t perform, so I put it through the wringer to see if it lives up to my expectations! – …Which isn’t so great if you play outdoors. I was pleasantly surprised by the quality and performance of this AEG, especially given its mid-level price point. My favorite part about it? It’s an M4 that doesn’t look like every other M4 on the field. I’m also a big fan of the split gearbox – the use of a few proprietary parts is a minor inconvenience compared to the ease of maintenance it brings. I might have a few small complaints, but the CXP Sportline is my new go-to carbine. All the parts that make the CXP SL tick; note the separate upper and lower gearbox housings. 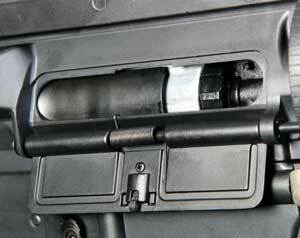 The lower handguard is removed by loosening one nut, but you won’t find much space under there. From the outside, the polymer upper and lower receivers of the ICS CXP .08 Concept Rifle Sportline (CXP SL from here on out) are pretty standard M4 fare. Despite not being metal, they feel solid, and I can find no reason to doubt that they’ll hold up to prolonged usage (provided you don’t use your carbine as a melee weapon, or to drive tent stakes). 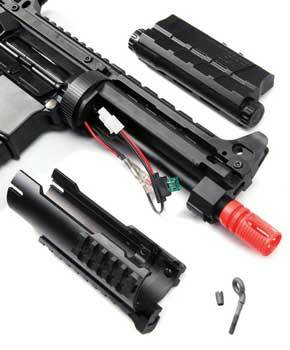 The magazine release button and catch are plastic and metal respectively, and function just as they should. The single-sided selector switch (which has the standard Safe – Semi – Auto markings) feels a bit spongy, but works just fine. Moving on to the upper receiver, you’ll find a charging handle that you can pull on to open the dust cover, revealing the hop-up and its adjustment wheel. The forward-assist can be used to relieve the spring tension in the upper gearbox and reset the piston, which will theoretically prolong the life of the spring if used before storing the gun. The A2-style rear sight is adjustable for windage and elevation; the elevation adjustment knob clicks into numbered positions, and there are witness marks on the back of the sight to see what your windage is set at. There are two apertures available – if you find that you need more precision than what the standard-sized ghost ring aperture provides, you can flip up a much smaller peep-sight for taking those longer shots. One thing worth pointing out is that the rear sight and the rail attached to it are removable – there’s actually another rail under all of it (Railception?) that you can use if you prefer a flat-top carbine. Getting closer to the business end of the CXP SL, things start to look a little different. Instead of your typical two-piece plastic handguards or metal quad rail, you get a two-piece round metal handguard with sections of rail bolted to it. The one-piece top rail/front sight combo is detachable, and the front sight post is adjustable, rather than molded-in like some budget guns; ICS even includes an adjustment tool in the box. The stubby side and lower rails are made of plastic, and if this bothers you, never fear: they’re removable, and can be replaced with rail segments of the length and material of your choice. The lower handguard itself is held in place by the sling mount eyelet bolt; it wobbles a little, but not enough to notice out in the field. The inner and outer barrels of the CXP SL are both eight inches long, and the outer barrel has 14mm CCW threads for a muzzle device. The inner barrel’s bore diameter is 6.08mm. Bringing up the rear of the gun is a 6-position retractable stock that looks almost like something you’d find on an MP5. The lugs that lock the stock into position are beveled; the locking lever needs to be depressed to collapse the stock, but not to open it. Just pull the stock rearward and you’ll be greeted by a satisfying series of ratchet-like clicks as the stock telescopes out. My personal favorite feature of the stock is that the low comb profile makes the gun very easy to use with a rigid face mask; with more traditional/full profile stocks, it can be difficult to get a good view down the sights. Even with my V-Force Profiler mask, I can get a good sight picture without having to mash my face into the gun. Lastly, there’s a D-ring built into the buffer tube for sling attachment. It’s ambidextrous, but all you lefties out there will have to do a little disassembly to flip the attachment block around. The CXP SL comes with one Thermold-style plastic hi-cap magazine that’s good for about 300 rounds. The plastic it’s made of is a bit on the thin side, but it functioned flawlessly throughout testing. Should you find that one magazine isn’t enough to satisfy your BB-slinging needs (and I’m guessing you will), you’re in luck, as any commonly available M4 magazines will work. I tested it with various high and mid-cap magazines with no anomalies to report. Speaking of what’s in the box, let’s go over that quickly. You get the gun, the magazine, a front sight adjustment tool, a PEQ battery box, an informative DVD, and a small bag of an undisclosed amount of .20G BBs (about 500 by my guesstimation). The DVD has instructional videos on the assembly and disassembly of various ICS products, which I found useful enough to not relegate it to coaster status. Notably absent are a battery and charger. And now we come to my biggest gripe with the CXP SL. Maybe I’m just spoiled by rear-wired guns with spacious crane-stock battery compartments, but the battery space under the front handguards on this gun is very limited. If you want to use a NiMH battery, you’ll need to use one that has “AA”-sized cells, and it still requires a somewhat oddball pack configuration. I found it easier to use the included PEQ box; you still need “AA” cells, but I found that I could fit my quad-nunchuck 9.6V NiMH pack (four sticks of two cells each) or a stick-type 11.1V LiPo in the PEQ box with just enough room to close it without pinching any wires. Most of the testing was done with the 9.6V NiMH pack, but I ran a few magazines through it with the 11.1V LiPo pack, and the rifle never missed a beat. The upper and lower receivers split open by pulling one pin, allowing the upper gearbox to slide out. And now on to the star of the show: the ICS split gearbox. It’s mostly a standard V2 M4 gearbox, but with a twist: the gears get their own box in the lower receiver, and the piston/cylinder assembly gets its own box in the upper receiver. 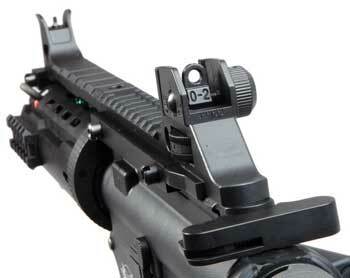 This is a standard feature on ICS M4/M16 AEGs, and I’m a big fan. From a maintenance standpoint, it breaks the gearbox down into two separate systems that can be worked on independently; you can change out a stripped gear without having to wrestle with your spring and spring guide, or you can swap your spring and replace a stripped piston without having to worry about your gears and shims falling out. The upper gearbox slides right out of the upper receiver; all you have to do is remove the rear takedown pin and the receiver splits open, just like a real M4. 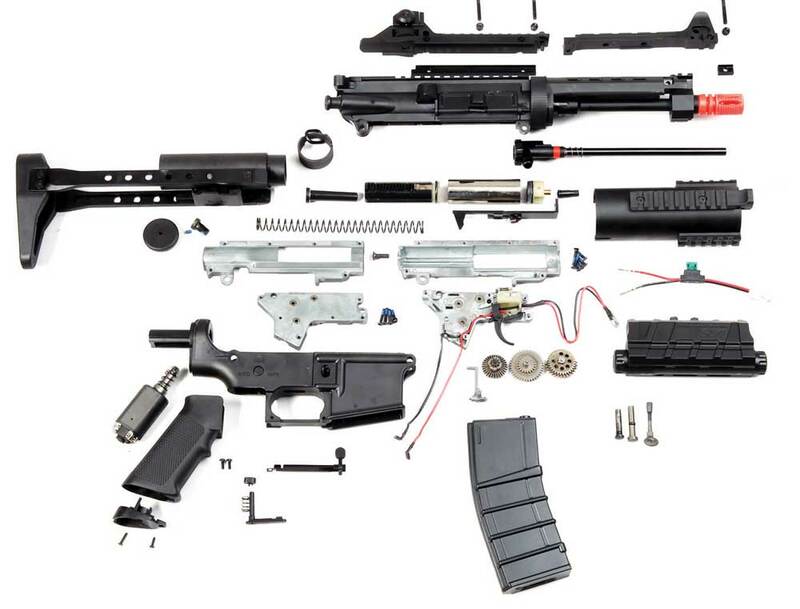 Another benefit is that it enhances the modularity of the M4 system – it only takes a few minutes to swap the upper gearbox for one that has a stronger spring to go from indoor to outdoor velocities, or even swap entire uppers for a whole new class of rifle. Of course, there are a few downsides to this system. Because you can’t really see how the teeth on your piston are meshing with your sector gear, it’s more difficult to properly set your angle of engagement. Also, a proprietary design means proprietary parts; while most of the gearbox parts on the CXP SL are standard V2 components, the gearbox shells, anti-reversal latch, air nozzle, and hop-up are all ICS- specific. Because the gearbox shells are non-standard, it takes a proprietary upper and lower receiver to hold it all together, which in turn requires mostly non-standard furniture. That’s not to say that you can’t fit aftermarket parts on your ICS gun, it just means it might take a little more ingenuity (and perhaps a Dremel) to make it work. The specs of the gearbox components are all listed elsewhere in this review, so let me get to my one gearbox-specific complaint: 6mm bushings. My problem isn’t so much that they’re bushings, but that at 6mm, they’re on the small side. One very basic AEG upgrade is to swap out bushings for ball bearings, and the general consensus is that tiny 6mm bearings simply don’t hold up well to the loads they encounter pulling a heavy spring over and over again. I’m personally fine with the performance I got from the bushings, but I don’t really like being stuck with them. The trigger feels like most otherV2 M4 triggers: smooth, but sort of spongy. In use, I never really thought about it or noticed it…no news is good news, I suppose. As mentioned earlier, the hop-up (but not the bucking) is proprietary. It works well, and once I set it where I wanted it, it stayed put. If you decide you just have to have a different hop-up unit, I’ve heard through the grapevine that you can fit an aftermarket unit with the judicious use of a rotary tool, but I don’t feel the need to. The hop-up unit is a proprietary ICS piece. I decided to begin my performance testing in the most exciting way possible: shooting through my Xcortech x3200 chronograph to get velocity and ROF numbers. Using .20G BBs, the CXP SL averaged 325 FPS, and using .25G BBs, the average was 299 FPS. Consistency was decent; deviation from the average was only 6 FPS in either direction. While somewhat unimpressive for outdoor use, these velocities are right where they need to be for indoor CQB fields. What did impress me, however, was the rate of fire this gun is capable of out of the box. I tested the gun with 8.4V NiMH, 9.6V NiMH, and 11.1V LiPo packs, and recorded rates of fire of 16.8, 18.6, and 23.9 RPS, respectively. This is definitely one of the faster shooting guns in this price range I’ve come across. With all those fun numbers measured and recorded, it was time to get on the field. I tested the CXP SL at Tac City South in Fullerton, CA. 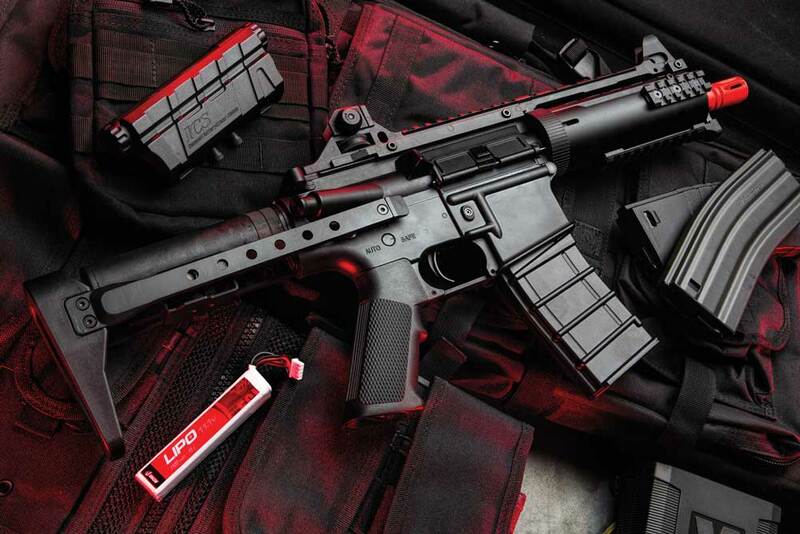 Tac City is an indoor CQB field, the perfect testing grounds for a short-barreled M4. I might look like a bumbling fool trying to run and navigate a plywood maze (cue the Benny Hill music), but the CXP SL ran like a champ. The short barrel and adjustable stock made it easy to get in nice and tight behind cover, and I really appreciated the fact that the minimal stock made it easy to get a good sight picture with the iron sights while wearing my paintball-style facemask. While some might see the plastic body as a downside, I see its lighter weight as a plus – getting the gun on target and maneuvering it around obstacles was quick and easy. 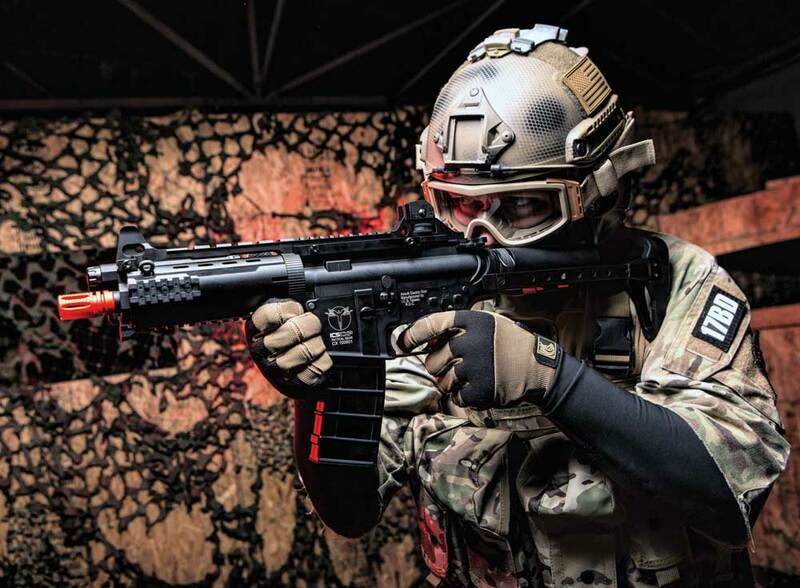 Although CQB games are generally over pretty quickly, the lighter weight would also help reduce fatigue if you were playing longer games outdoors, trekking up and down hills and through other difficult terrain. 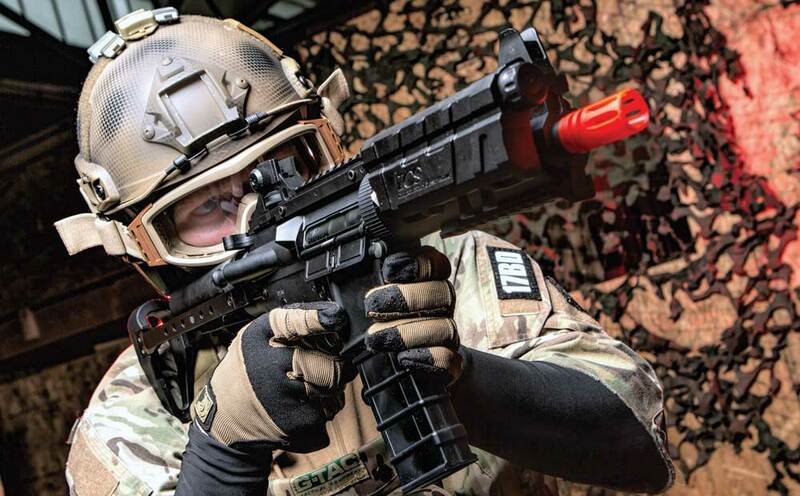 At CQB distances, accuracy was never an issue, and even with just a 9.6V battery, the CXP SL could keep up with most of the other guns on the field. I also got the chance to test the gun at longer distances, and to be perfectly blunt, it’s no sniper rifle. The relatively low velocity put it at a disadvantage against the guns that were shooting closer to the 400 FPS mark, but I still had no problem consistently getting hits out to 130 feet or so. You can certainly get hits further out than that, but shooting for distance isn’t this gun’s forte. With that said, the CXP puts BB’s right where you want them at normal engagement distances. I really enjoyed using the CXP SL, but there are a few things I’d like to change. While accuracy was acceptable at normal distances, I think a tight bore barrel would be a great starting point for upgrades. The rest of the things I’d change have more to do with durability; if and/or when the plastic gearbox components (the spring guide and piston specifically come to mind) break, I’ll probably replace them with metal pieces. Overall, I’m quite pleased with the ICS CXP .08 Concept Rifle Sportline, especially when you factor in the mid-level price point. The split gearbox might have a few idiosyncrasies, but after trying it out, I’m a big fan of the design. The ability to quickly swap out gearboxes (or complete uppers) in minutes flat to customize your gun to your mission is pretty nifty, and I’m looking forward to getting my hands on some more ICS parts. It could use a few tweaks here and there to realize its full potential, but right out of the box, you get a well-built gun with solid performance.